The charges form the crux of a federal discrimination lawsuit that goes to trial this month. In 1996, Sylvester Johnson left his post as a commanding officer in the US Army and began a career managing logistics at Walmart’s corporate headquarters in Bentonville, Arkansas. Once there, he received a series of rapid promotions, eventually overseeing the HR management of over 26,000 employees in five states. He became friendly with Walmart executive Mike Duke, who became CEO in 2009. In 2002, Johnson received the Sam M. Walton Hero Award, a prestigious company distinction. In 2003, he moved to North Carolina where he oversaw eleven Walmart Supercenters. The company fired him in 2009 for allegedly giving orders to manipulate inventory counts, a claim Johnson denies. Instead, Johnson believes he was ultimately terminated because he is black. He also alleges—in an interview with The Nation and in a federal discrimination lawsuit—that the company engaged in widespread inventory manipulation. “We're talking about hiding tens or hundreds of millions of dollars in losses here—inflating the profits of a store, a district, a region, a division and ultimately the entire company,” Johnson told The Nation. In theory, such a practice could have artificially inflated the company’s profit margins and stock price, amounting to a form of federal securities fraud. Johnson claims that during his tenure as a Walmart district manager he was pressured by the company’s high command to hide losses due to “shrinkage”—defined as lost or stolen inventory—in order for stores to appear more profitable than they really were. Throughout the course of over six hours of interviews with The Nation, Johnson maintained that top management set shrinkage targets for Walmart Supercenter stores under his supervision that were “not ethically attainable” and then used methods of “fear and intimidation” against him in an attempt to compel him to meet those targets. Shrinkage represents a loss to any firm’s bottom line. It is a major factor in retail profitability, costing US retailers an estimated $34 billion in losses annually, according to the National Retail Federation. Johnson’s case, which goes to trial on April 22 in a North Carolina federal district court, seeks to prove that he was treated differently than his white counterparts. He argues that while white district managers were manipulating inventory counts to make their stores appear more profitable, he refused to engage in such a practice and was fired on false charges of doing so. In recent years Walmart has faced a series of high-profile discrimination suits, including the largest class action discrimination case in American history, Wal-Mart v. Dukes, which was thrown out by the Supreme Court in 2011. In 2009, the company paid $17.5 million to settle a suit alleging the company had discriminated against African-American job applicants. Johnson says that he didn’t “play ball” with Carmon’s orders. In October of 2008, Walmart began investigating claims that Johnson was giving unethical directives. The company terminated Johnson’s employment in January of 2009 on the grounds that he instructed his subordinates to manipulate inventory accounting—the very practice that Johnson claims he refused to engage in. The following year, he filed suit. According to Johnson, the practice of manipulating inventory counts extended beyond just the regions Carmon supervised. Johnson says he reviewed the shrinkage rates of over 400 Walmart stores around the country and was astonished at what he saw: impossibly low inventory loss rates to the point that stores would commonly display a negative rate of shrinkage, known as on “overage.” An overage occurs when records show quantities of inventory on hand greater than what was shipped to the store—a sign of either accounting or shipping errors, or deliberate fraud. So far, Johnson’s legal team has obtained documents detailing shrinkage rates in Walmart stores in North and South Carolina. But Walmart has refused his request to hand over similar documents across a broader region. Johnson argues that such documents are essential to prove whether the company indeed manipulated inventory counts on a large scale. After reviewing the available documents, Peter Bell, a certified public accountant in Charlotte, North Carolina, and Johnson’s expert witness, stated that “the documents that were produced to me lead me to the conclusion that Walmart may be manipulating its accounting records—the evidence of which, if true, would necessarily mean that Walmart is engaging in a form of accounting fraud." In late March, Walmart demanded that Bell’s testimony be thrown out, claiming that his findings were “non-committal speculation disguised as an opinion,” and that his expert witness statement lifted descriptions of retail accounting from textbooks without properly citing sources. 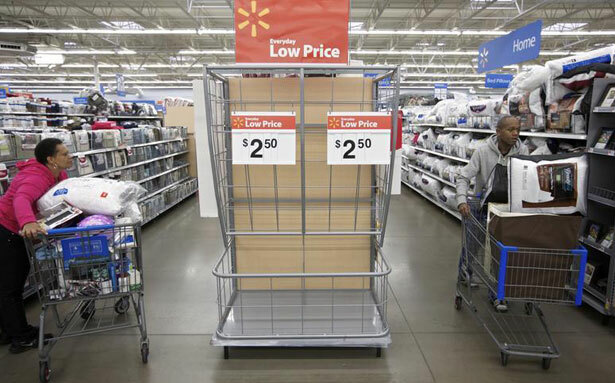 The issue of inventory manipulation, Walmart’s lawyers also say, is tangential to any problem of racial discrimination. “Even if Bell had an admissible opinion, that would do nothing to help [Johnson] prove what he ultimately must—that Walmart terminated him because of his race.” Walmart is being represented in this case by the law firm of Littler Mendelson. Huppertz says that consistent errors in inventory recording would make it difficult for any large company to keep its supply chain working efficiently. He has never heard of a company obscuring shrinkage loss to appear more profitable. Neither has Steven Platt, director of the Platt Retail Institute, a Chicago-based consulting firm that publishes The Journal of Retail Analytics. "Have I ever heard of this sort of fraud? No. Is it possible? Sure," Platt says. "All the hundreds of stores and all the employees involved would require a fairly massive cover-up. But Walmart has been accused of certain labor practices on a fairly massive scale in the past, and those turned out, I believe, to have been true." Johnson will not say whether he believes the whole of Walmart is pervaded by discriminatory attitudes. But he will recount the scene at Walmart’s semi-annual conferences that gather district managers, known in the company as Market Managers, from all across the country. Because there were so few black managers at these gatherings, Johnson says that a common line among them became “What’s the count this time?” Johnson recalled that, often times, out of the roughly 350 Market Mangers in a meeting hall, about thirteen were African American. In "This Week in Poverty," Greg Kaufmann breaks down the connection between sequestration and homelessness.